Just a quick recap! Week one’s blocks included a scrappy 4 pointed star, a color wheel, hexi log cabin, and a messed up tilted pinwheel. The Scrappy Four Pointed Star was my first block for this quilt. There are so many measurements you can do for this block. It is so easy! First sew your back ground. This can be solids or stringed together like I did. This is a great scrap buster! I sewed 5″ strips together of different widths until I got to about 20″ long. Press, press, press. Cut this rectangle down to four blocks 4 1/2″ x 4 1/2″. Then take your fabric for the center star and cut two rectangles 2 1/2″ x 4″. This can actually be wider or thinner if you please. Then cut the rectangles in half on its diagonal. Sew the hypotenuse of this new triangle to the square so the it covers the bottom right corner. Do this in the same place and direction on the other 3 squares. Press. 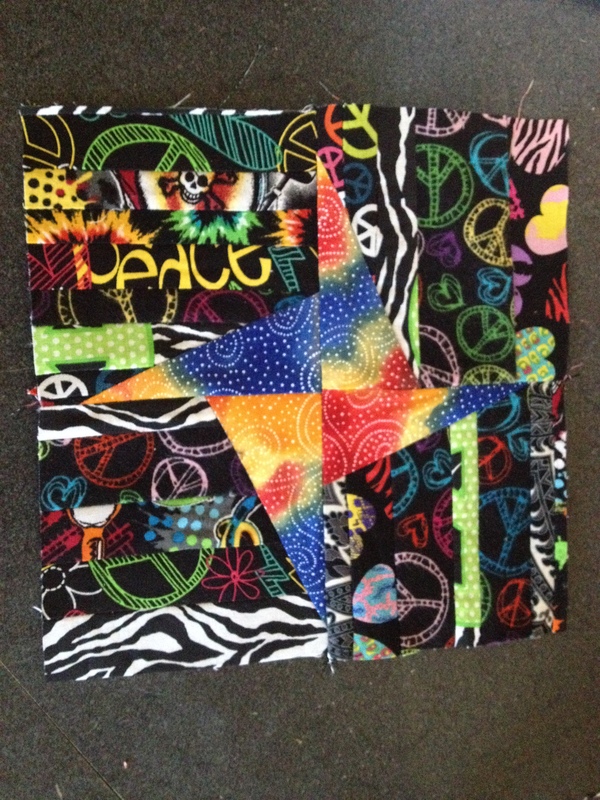 Sew these together to make your block! Make sure to press! The next one is the color wheel. I made my own template for this. I have a handy dandy circle cutter that looks like a compass we used in elementary to draw circles. Take a piece of paper, draw a circle on it (I used a lid). Measure the diameter (this is the distance across the circle. Divide the circle up as you please. I divided mine into 8 pieces. Then draw another smaller circle in the center of that wheel. Erase the lines in the inner circle that came from making the wheel lines. Next, trace the shape of one of those wheel pieces and the center circle onto some tracing paper. Add 1/4″ around the wheel piece and the inner circle. Now using another piece of tracing paper to make the background inverted circle by tracing the square and circle. The add 1/4″ or more to the inner part of the circle. Cut out the new template with scissors other than your fabric scissors please! I replaced mine during this project because 10 years of cutting fabric and paper destroyed mine. Now for the fabric! This is another great scrap buster. Cut out your pieces. Then sew the wheel pieces together. 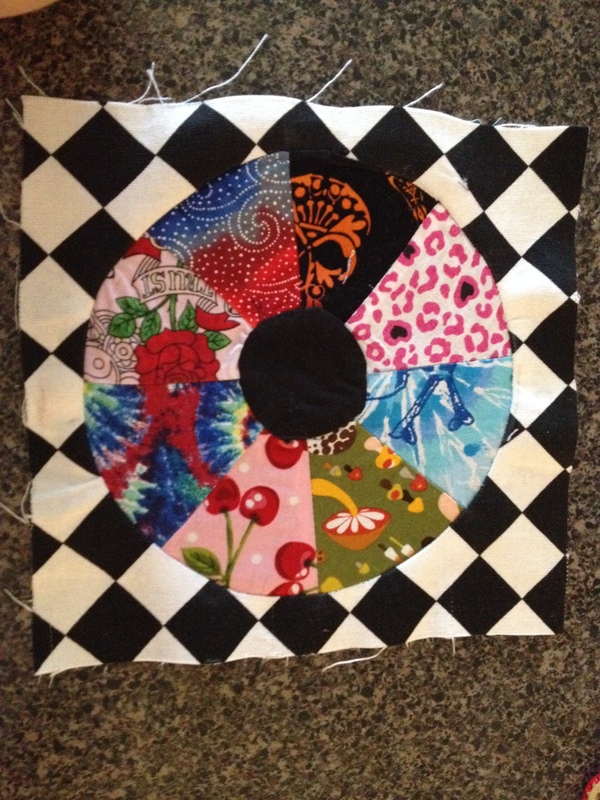 Next sew the inner circle to the center of wheel. Sew this new circle to the inside of the background fabric. This sounds harder than I explained. I think I sewed both circles a couple of times before I got it right. Pinning the circle to the background at the top, bottom, and sides helped. This next one is a block that I made up and messed up. I wanted it to be a tilted pinwheel inside of a square. 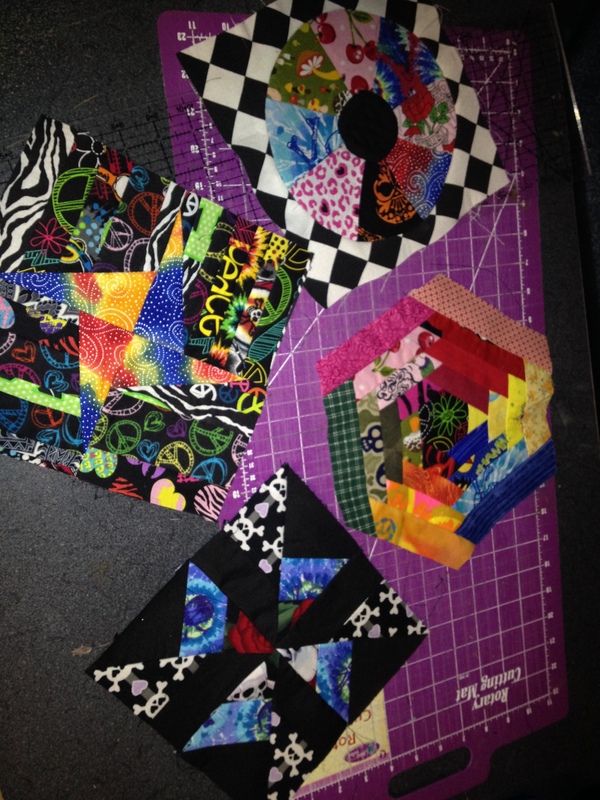 So what I desired to do was sew eight 5 1/4″ HSTs in black to two sets of different colored fabric 5 1/4″ HSTs . The black would be to the left of one color and the right of the other color. Then sew them together to make a square. Assemble the block. The last was a hexi log cabin. I used a template for the hexagon. Then added 1/4″ seam allowance. Cut strips of desired fabric at 1 1/2″ wide. As I sewed and pressed is when I trimmed off the excess. I used the same color scheme for each side of the hexi. That would be yellow on one side, red on another, and so forth. So for the first strip, I sewed the strip to one edge of the hexi. Then pressed and cut the strip in line with the closest hexi edges. The first one will look like a head wearing a small hat. Then rotate the hexi to the next side and sew another strip to the hexi and the edge of the first strip. Press, trim, repeat. Do this until you have reach your desired size. I will finish mine by adding fabric to the corners to make a square. Have fun and I hope your tilted pin wheel doesn’t turn out weird like mine. But then again, this whole quilt will be weird! And weird is cool.